Made from industrial strength MDPE (Medium Density Polyethylene) the 1950ltr is a durable water tank. Ideal for both domestic and commercial use. Extremely versatile storage tank ideal for water, chemical etc. Has the ability to take from 8mm in/outlet up to 110mm in/outlet in various positions. Connect multiple tanks together using, up to 4" (110mm) outlet pipe. This is a good idea if you are unable to fit one large tank in the ground. You can instead have a line of tanks in a small long trench. 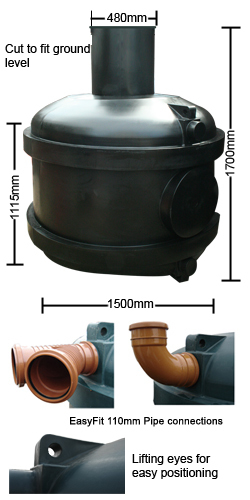 The neck ring on top of the tank can be cut to fit flush with the ground level, making it ideal for installs with tough ground types such as clay.